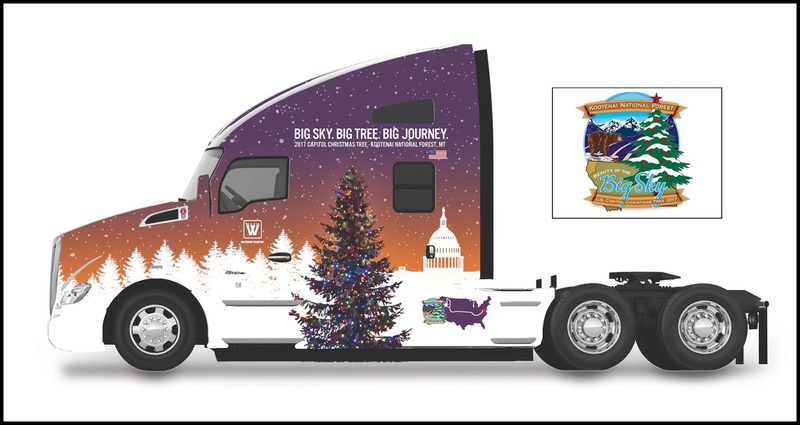 KIRKLAND, Wash., Oct. 11, 2017 – A Kenworth T680 Advantage will transport the 53rd U.S. Capitol Christmas Tree from the Nov. 8 tree-cutting in the Kootenai National Forest in Montana to 15 community celebrations during the more than 2,000-mile journey en route to the tree-lighting ceremony in Washington, D.C., in early December. The fully loaded Kenworth T680 Advantage features the PACCAR Powertrain with the PACCAR MX-13 engine rated at 455-hp and 1,650 lb-ft of torque, new PACCAR 12-speed automated transmission, and PACCAR 40,000-pound tandem rear axle. The T680’s specifications include Kenworth’s TruckTech+ remote diagnostics, predictive cruise control, idle management system, driver performance center, and premium GT703 seats in addition to high-intensity discharge (HID) headlamps, Bendix(R) Wingman(R) Fusion(TM) driver assistance system, and tire-pressure monitoring system. For more information, including a complete tour schedule, visit the 2017 U.S. Capitol Christmas Tree website at: www.capitolchristmastree.com.